It's always good to wrap things up and let the customer know that their booking process has been successful. One way to do this is with a thank you page on your website. You can use Appointlet's Redirect URL feature to send people to that page. 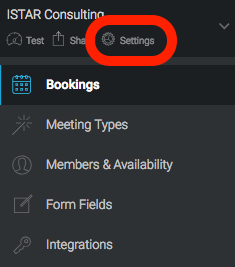 To get started, click on the Settings icon in the upper left hand corner of the dashboard. Simple enter your thank you page URL inside the text field and close the settings panel to save it. Note that for advanced developers, you can also use the curly brace notation to pull properties off of your booking information and pass them through the URL. You can read more about Redirect Variables here.